Dr. Cuyler talks with Students at the FAMU Feeder Fair. 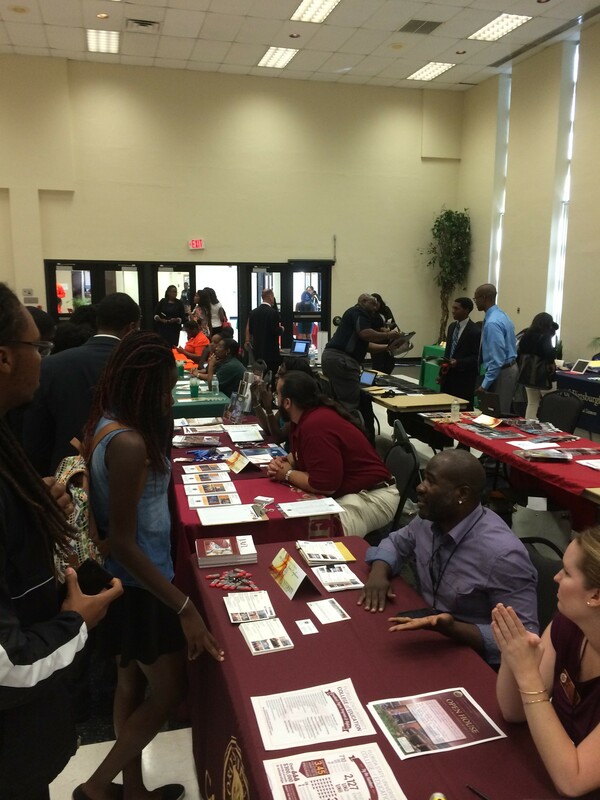 Last weekend, September 10th through the 12th, Florida A&M University (FAMU) hosted the Graduate Feeder Conference and Recruitment Fair. This event is aimed at broadening the opportunities of students within the Graduate Feeders Scholars Program (GFSP) as they choose to pursue graduate and post-graduate studies in degrees not offered at FAMU. “The GFSP, in the School of Graduate Studies and Research, is an official partnership agreement arranged by FAMU with more than 40 participating universities located throughout the United States. The GFSP affords FAMU students the opportunity to receive advanced study in graduate programs not available at FAMU. The feeder arrangement was conceptualized and created in response to the national need to increase the number of African Americans participating in advanced graduate education. The GFSP was designed with FAMU as the lead university in this consortium. As the lead institution, FAMU acts as the hub of the consortium with a committed role of providing a pool of qualified underrepresented minorities motivated to pursue the Master’s or Doctoral degrees” (FAMU School of Graduate Studies and Research, 2014). Students who are accepted into the fellowship program are offered a two year award covering tuition costs for their graduate level studies, or a four year award covering tuition costs for a doctoral program. At the conference and recruitment fair, Florida State University Arts Administration graduate program was well-represented. Dr. Antonio Cuyler, Dr. Ann Rowson Love and Dr. Pat Villeneuve each provided interested students with information and answered a variety of their questions. FAMU students engaged with the faculty members, prompting interest around the Arts Administration program as well as the Museum Education and Visitor-Centered Exhibitions program. We value the commitment to diversity that this event reflects and are glad of the opportunity to work with FAMU to continue developing diversity in graduate and post-graduate studies.